Life's crazy busy right?! The 'juggle' is real, the pressure is high, the expectations, well, they're even higher. You're not alone, in fact it's one of the things that unites us (the fact that no-one - despite what it might look like - no-one really has their sh*t together). So how do we keep striving for an epic life? A life filled with meaning, even amongst the busyness? And how do others face these same fears and questions? It's this curiousity that sits this podcast series. Stand Out Life is a podcast dedicated to living boldly amongst the busyness; finding those little moments of magic amongst the mess. Throughout these podcasts I sit down with influential women - and a few good men - and chat about how they live a life of purpose while making progress. We dig into their stories, both the success and the struggles and in doing so, we get some amazing insights into what it takes to live big in this crazy busy world. Let’s dive deep into what it takes to live a Stand Out Life. She's been Australia's high priestess of pop, an award winning jazz singer, wears the hat of a fine artistic director and, above all that; Kate Ceberano is a songwriter with the talent to take a tune to the top of the charts. 24 albums over 30 years makes Ceberano the most prolific Australian female recording artist of this era. Her work, her craft and her vision are now imbued in our collective DNA. Throughout this conversation Kate shares reflections of 30 years in the industry, we unpack how even in her early years she was shown the power of music as a form of expression, and she shares the moment in her career still gives her goosebumps (and it gave me goosebumps too for that matter). A deep thinker and clearly with philosophy not too far from her thoughts Kate shares how she navigates her own energy, and the importance of saying a powerful no. A bonafide national treasure, possessing one of the great voices of her generation. Soak up the beauty that is Kate Cebrano. In her role as a stylist Anna’s ultimate goal is to teach her clients how to find and refine their own style to reveal, and I love this, to reveal their favourite version of themselves. She is passionate about enabling clients to shed anxieties about the way they dress and embark on new beginnings. I’ve had the great fortune of working with Anna for the last few years and her approach is warm, relaxed and inclusive. She has a way of understanding what is going on in the world of the people she works with and leaves them feeling lighter and more connected to who they are; because what we wear is a big part of our identity. In this chat we talk about the role that clothing has in confidence, we explore the world of sustainable fashion, and why being more conscious about what you have, and what you need is the key to feeling great. Anna’s work is heart-felt and impactful and will leave you looking at your wardrobe differently. Enjoy this conversation with the beautiful Anna Mabin. Raised in the small country town of Carcoar, Kurt Fearnley has always been determined. Kurt has achieved extraordinary feats from crewing a winning Sydney to Hobart yacht, crawling the Kokoda Track and winning dozens of marathons around the world, many of them representing Australia. In April 2018 Kurt finished his Australian representative as he started it, on home soil, with a win in the marathon at the Gold Coast Commonwealth Games. Since hanging up the green and gold, Kurt has been busy. He has also been recognised in multiple sphere’s, including being awarded 2019 NSW Australian of the Year. This conversation was recording, sitting on a couch at a hotel a week before the announcement of 2019 Australian of the Year. Kurt is humble when I asked him about the potential of being awarded this honour and shifts quickly to what he sees as his responsibility to influence politicians, corporations, and education systems to give people with disabilities more choice then they are current afforded. From growing up on a tobacco plantation to becoming the Commissioner of QLD Fire and Emergency Services Katarina Corroll knows what hard work and resilience is. 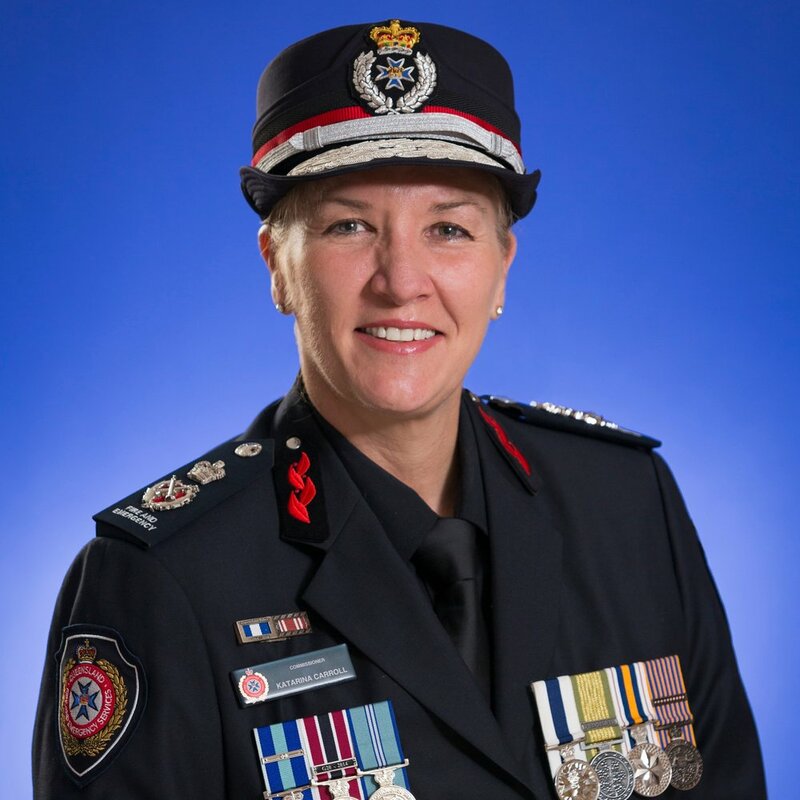 After starting a social work degree, Katarina joined the police force and found herself moving up through the ranks to become the Assistant Commissioner with the QLD Police Service, before moving to the role of Commissioner with the Firies. If you are in a leadership role, or aspiring to be in one then you won’t want to miss this insightful conversation with Commissioner Katarina Corroll. Dharmica was awarded a PhD from Macquarie University for her work on the detection and characterization of novel biomarkers in blood and hair that could be used as the basis for a blood test for breast cancer. In 2016 Dharmica was the recipient of the “NSW Young Woman of the Year” award. She was also announced as Young Executive of the Year (2016) in Australia by the Australian Financial Review (AFR) Boss Magazine. In this conversation we unpack the role of female scientists and the personal determination required to work in the world of uncertainty and innovation. Listening to Dharmica talk about her work made me want to don the lab coat - she is passionate about her craft. Today’s conversation is one with a difference. When I asked today’s guest for her bio she came back to me and said ‘everything I had identified with before has changed and really I’m just a person who’s done a hike’. And not just any hike. Kirsten Stallard spent 155 days walking the Pacific Crest Trail from Mexico border to the Canadian border covering 4270km of terrain, starting with 42 days across the desert and finishing through snow and freezing conditions. Why you might ask? Well I did. Kirsten had realised that her life needed to change and as an extrovert wanted learn how to be alone. She left her job, a 6 year relationship and found the PCT calling her. This conversation is extraordinary as Kirsten shares the paradox of completing a pilgrimage like this. We talk about the little details like what you eat, to the big lessons you learn along the way. If you’ve ever had the yearning to put quiet to the noise, don a backpack, and step away from life then this conversation is an adventure worth hearing. Founder and Creative Director of global Swedish design and stationary business Kikki K, Kristina is the epitome of someone who had a dream and then did the work to turn it into a reality. Whilst she has achieved global success with this brand you’ll hear from our conversation that Kristina believes that she’s only just starting and there’s so much more to do. Aside from business growth Kristina is on a personal mission to inspire over 101 million people to write their own dreams on paper and set about bringing them to life. So passionate about the movement of dreams Krisinta has written her book ‘Your Dream Life Starts Here’ which is a practical guide to dreaming and bringing these dreams to life. We chat about the power of dreaming, the challenge of navigating people who may not support your dream, and the grit that is required to do the work, even if obstacles come your way. Mae works with the forgotten and ignored children of northern Thailand, many of whom have HIV. She is the director and founder of the wonderful home in Thailand Baan Home Hug for the past 30 years. She has borne witness to stories which if I didn’t know better or I hadn’t witnessed first hand, I would question the validity of them. Mae battles with terminal cancer but her mantra of ‘I am strong’ means that she continues to defy medical rationale of her illness. Powered by love, driven by strength, focused on others in a way that few others do means this is a story that will stay with you long after listening. I know for me my life is changed because of the time I get to spend with Mae Thiew. Karni Liddell is a force of nature. She has an enthusiasm for life that is contagious and an advocacy approach that will get you thinking about important topics in the world of disability. At 12 months of age Karni was diagnosed with muscular dystrophy, her parents were told that she would never be able to walk and that she would not live past her teens. Defying the odds Karni competed at two Paralympic Games, 1996 and 2000, winning bronze in womens 50 m freestyle in Atlanta games, and bronze in womens 4 x 50m relay at the Sydney Games. We talk about life as a single parent, the judgement that she combats being a single parent in a wheelchair, and her drive to educate others about the importance of inclusion. We also dove into the confronting, but important topic of violence towards people with disabilities. The research in this field is limited but the rates are alarming. Get ready to laugh and even shed a tear as you hear from the powerhouse that is Karni Liddell. Lola Berry is Australia’s leading nutritionist, appearing regularly on television shows such as The Project, The Today Show and A Current Affair. She is a spokesperson on nutrition and general wellbeing in print and on radio, and has a huge and interactive online following. She has published 10 books, including her latest book The Yoga Body. She has a smoothie bar in Melbourne called The Happy Place. We chat the power of yoga, navigating business, failures, and ways to look after your health and wellbeing when you travel. Lola embodies her latest book, The Yoga Body, and unpacks this as a practice that all of us can connect with in our own way. Full of life and an adventurer at heart, soak up this chat with Lola Berry. At the age of 16 Layne Beachley became a professional surfer and went on to become the greatest surfer in history securing 7 world titles and has recently just won her 8th world Masters championship. But her success hasn’t come without hurdles. In our chat Layne shares how her first 6 world titles were won on fear, and her sweetest one was the 7th which she embraced the language of love, realised she was enough and gave up the struggle. Having losing her mum early in life, finding out she was adopted at the age of 8 years, and chronic fatigue later in life Layne has fought her was back to herself. Married to Kirk Pengilly from INXS fame, Layne lives a full life as a keynote speaker and currently serves as the chair of Surfing Australia. Layne is as down to earth as you’d expect and is the evidence of someone who challenges not only their external world, but her internal world on a daily basis seeking to life an unstoppable life. Soak up the love of life that oozes from Layne Beachley. Andy is a pastoral, skate-boarding, accountant. I did ask him the obvious question - why accounting? Andy lives his life with the philosophy that it’s our responsibility to help others. When we do that we end up being gifted with some much ourselves. It’s this philosophy that has guided his work for the past 21 years. Andy is the founder and CEO of Red Frogs Australia, a program supporting young people. Redfrogs mission is to provide a positive peer presence in alcohol-fuelled environments where young people gather, educate young people on safe partying behaviours, and with their random acts of pancakes give them something else to do. RedFrogs is now the largest support network in Australia for Schoolies, Festivals and Universities students, and they have gone international with their work. We chatted about Andy’s drive in the work that he does, how we manages his energy after 21 years at the cold face and why the value of sitting and connecting can be life-changing. Be ready for something to spark a change in you as you hear from Andy Gourley. Pip Edwards has made her mark utilising her name sake initials and retro-tomboy style to launch P.E Nation. With an impressive history in Fashion, and a Bachelor of Commerce/Law Pip had the platform set to create something unique. Her longstanding fashion career has seen her work with brands such as Ksubi, DLM, Sass & Bide and General Pants Co. In this episode we talk about personal growth and pilates reconnected her to a feminine energy that she had ignored for many years. Pip is on a personal journey of self and you’ll hear the strength of her purpose behind everything she does - her son Justice. She is also passionately believes that P.E Nation is a platform to lift women up and encourage them to boldly chase whatever they want to chase. Pip is the embodiment of this brand. Having already achieved so much, I have a feeling this is a name you’ll hear more of in the future. Enjoy this conversation with Nicole Gibson. Hetty is a woman of passion and determination and in 1997 she established Bravehearts Foundation - Australia’s leading child protection advocate. In 2016 Hetty was acknowledged for her work in the community through an Order of Australia Medal. Finally we also chat about how to navigate ambition and self-care - something that Bec has now learnt the importance of. Smart, thoughtful, and determined - enjoy this chat with Bec Brideson. As a teenager Giaan Rooney was faced with the choice of diving (pun intended) into a swimming career or pursuing a career in netball. She choose swimming and went on to compete on the world stage, winning an Olympic Gold Medal and breaking a world record amongst other achievements. Sarah walks her talk encouraging others to live with less through messages about minimalism and anti-consumerism, in fact her latest book just realised ’Simplicious Flow’ is a call to zero waste cooking. Liza-Jayne (LJ) has almost three decades of experience helping organisations, causes, and individuals successfully grow their profiles and accentuate their positive. She has worked at the highest levels of media, government and business as a journalist and trusted adviser. It was her closer friendship with fellow Journalist Tracy Spicer that also set her on the path with NOW Australia and Outspoken Women. After Tracy shared a tweet in October of 2017 and received an overwhelming response in light of the #metoo movement it was a realisation that it was time to add to this conversation. LJ shares her personal drive to make the most of her life and how to look at and navigate the inevitability of mistakes. One of the things I loved about this conversation was how real and honest LJ was in sharing the imposter syndrome that she still feels at times that prompted her year of yes. She encourages people to find something that starts a spark in you, and pursue it. It is my hope that this conversation will spark something in you. Tara Moss is someone that I’ve admired for years, so to be able to share a conversation in a studio with her was an absolute delight. Tara wears many hats; she’s an author, a documentary maker, presenter, journalist, former model, and an advocate for women and children’s rights. Sarah is obsessed with wonder, productivity, creativity, innovation and curious about all things; the more out there the better. Whilst there are some components of this conversation that are tough to hear it is a truly remarkable conversation that ended with some long hugs between Jess and I. And that’s the power of creating connections and safe spaces to talk about grief and death. Grab your tissues, be kind to yourself, and carve out the space to soak up this life-affirming conversation with Jess Williams. Today’s conversation is with the ever positive Ellie Cole. Ellie has become one of Australia’s most accomplished Paralympians with 15 olympic medals and a world record. At age three, Ellie’s right leg was amputated after she suffered a life-threatening sarcoma cancer. When Ellie started swimming as a form of rehab post-surgery, doctors expected it to take at least a year to learn how to swim. It took her two weeks. Ellie shares stories about the power of gaining perspective, the essential role of gratitude, and the importance of normalising what we might see as a disability - but is really just her story. This is a conversation for the whole family to enjoy with the bubbly Ellie Cole. Award winning journalist, Mum to three school aged kids, and passionate activist for women and girl’s rights, today’s guest is a force to be reckoned with. She’s on a mission to challenge thinking about feminism and the role men can play in the conversation. In this episode she’ll share publicly how disempowering run-ins with high-profile men during her time as a television reporter sharpened her resolve to spark change. Some of what Martine shares is confronting and important to share particularly in line with the #metoo movement. What we know is that when we own and share our stories shame dissolves. Today’s episode is with a return guest to the Stand Out Life series, our first actually. Emma Isaacs was featured in Ep 2 and is the second most listened to episode of the entire series. Over the past thirteen years, Emma has transformed Business Chicks from the ground up, growing it from a group of 250 members to what it is today – a global enterprise that operates in two continents, 11 cities and produces more than 100 events annually, with past speakers including Sir Richard Branson, Seth Godin, Dr Brené Brown, Arianna Huffington, Sir Bob Geldof and Jamie Oliver. Born and raised in Sydney, Emma now lives in Los Angeles with her husband and five young children. Her book, which hit bookshelves in Australia last week, is called ‘Winging It: Stop thinking, start doing. Why action beats planning every time’. This book is captivating and in our conversation we dive into some of Em’s lesson’s about business, mindset, and why we need to stop taking it all so seriously. Its one thing to challenge your mates to have a month off the drink it’s a whole other thing to start a national initiative and charity fund-raising event. But 10 years ago that’s what today’s guest embarked on. Brett MacDonald was one of three British back-packers travelling through Sydney who all decided to have a month off alcohol after a few solid months of partying. Through building a website, linking it to fund-raising for cancer organisations and with the backing of a national radio presenter Adam Spencer, in 2008 Dry July was born. This is a fascinating conversation with Brett about his drive for change, the way that Dry July has needed to evolve and stay relevant, and his international ambition to utilise a new platform for fund-raising. The mission to find the right lip shade can sometimes be as difficult as landing the outfit itself. Today’s guest, Courtney Treacy has found a solution along with her sister Kimberley and it seems everyone is glad that they did. The Lip Lab was founded in 2015 after the sisters noticed that the personalisation trend was taking off and were driven to deliver a unique, customised beauty concept in Australia. Today The Lip Lab has more than 14 stores across Australia and is set to go international into Kuwait, Phillipines and India no less. This conversation is an great insight into how an idea can turn into a fast-growth business. Enjoy the energy that oozes from Courtney Treacy. Vet surgeon, business owner, and entrepreneur Dr Glen Richards knows a thing or two about success in the business world. Appearing as one of the sharks on Channel 10's hit show Shark Tank Glen believes that it's critical to invest in the successes of the future. In this conversation we chat about how a long train ride was the catalyst for a business plan that saw him become the Managing Director of national company Greencross and later co-founder of a company under which the well-known Petbarn sits; offering end-to-end services and care for companion animals. Glen continues to help foster early stage businesses including his Shark Tank investments through active mentoring, investing and strategic planning sessions. He regularly does public appearances and speaking engagements in the business community to share his scaling up story. Down to earth and real we talk about the essential non-negotiables to managing energy and relationships in business. It's not an easy road but one that requires decision and discipline. Glen has these and a generous spirit in bucket-loads. Kemi Nekvapil has had an extra-ordinary life growing up in England where she lived with five foster families. These early life experiences inform the work she does now, which is holding space for people as a professional coach, speaker and author. She has worked in the wellness industry for more than 20 years and works with big organisations including Price Waterhouse Cooper, Lululemon and Dermalogica, to name a few. In this episode we unpack how to ask for what you need in life - and what a gift it can be when we do, Kemi shares the importance of realising that you have permission to create the life you want (and quit with the excuses) and she also talks about her latest love which involves running ridiculously long distances through bushes and trails - and how this fuels her energy. Jam-packed with aha moments, challenges and new ways of seeing things, this is an episode you’ll want to put everything aside to really focus on. Have your pens at the ready as you hear from the incredible Kemi Nekvapil. Adina is the co-founder of innovative Australian technical goods company, STM Goods. She launched the company in 1998 in Bondi, Sydney with the goal of providing people with technical products that are beautiful, durable and functional. STM Goods is now a global industry leader in laptop bags, packs, fitted cases and other tech accessories designed to make life and business ‘on the go’ easier. It has doubled in size, tripled in revenue, has offices in Sydney, San Diego, London and Kuala Lumpur and has products available in more than 30 countries – presenting a very successful Australian entrepreneur success story in a competitive retail environment. Staying on top of technology changes is not the only thing Adina obsesses about, in fact, her main obsession is relationships. We discuss how critical this has been to building and adapting her brand, as well as how important building a group of people around her to keep her going through her business experience. There are plenty of gems in this fascinating chat with Adina Jacobs. Dr Nikki Stamp is a heart and lung surgeon, which means that she spends her days working on the edge of life and death. She has witnessed the inner workings of our bodies in a way that many of us are completely oblivious too. In this conversation you’ll hear her deep curiosity and fascination that drives her to explore what makes our hearts tick, what cures a broken heart, and how we should all be making it a priority to look after our heart. With the recent release of her first book ‘Can You Die of a Broken Heart?’ Nikki has a strong desire to change the way we think about health and women’s heart disease. This episode was one of the most fascinating conversations that I’ve had on this series. I promise you that your heart will thank you for taking the time to tune into this conversation with Dr Nikki Stamp. The key to what we often see as ‘gut instincts’ is greatly impacted upon by the way we use non-verbal communication. Michael Grinder has made it his life’s work to research non-verbal communication and deep perception of human behaviour. He is a master at it. At the age of 75 he spends his retirement - yes retirement - travelling the world continuing to educate people on leadership, group dynamics and the subtle science and art of perception. He is a master of his craft and his insights are powerful. One of my favourite people to spend time with, soak up the deep wisdom from a career of research that is the master of Michael Grinder. Pioneer is one of those words that is often thrown around, but today’s guest, Bree Brock, is at the forefront of a new era in women’s sport in Australia. As the CEO of the Brisbane Lions women’s team, Bree is the only female CEO across all AFL teams. She unpacks her own rise to leadership, what she has learnt along the way and the vision she has for the future. We also dig into the frustration of success, when you are so close, but still don’t walk away with the ultimate success as two years running her team, Brisbane Lions women’s team, have made it to the grand final and lost both games by the narrowest of margins. For all of us facing set-backs the conversation about what you do next is a useful one. There are plenty of gems in this chat with someone who’s at the forefront of change. When it comes to putting yourself in the way of hard things, and having gone through hard experiences, this episode's guest has a few stories to tell. You may know her as one of the final three people left on the 2016 series of Survivor in Somoa. Aside from her gruelling 54 days on the island, and the toughest 6 1/2 hour challenge she’d ever faced, El Rowland has a fascinating story. She has spent 13 years in her career in the army and only just last year made the courageous decision to leave and step into the unknown future of her own businesses. El has experienced the depths of mental illness and shares the darkness of depression and anxiety that we often don’t hear about, which you can hear still brings up emotions for her. She also unpacks how she has found her way back to hope. This is a beautiful and real conversation with El Rowland. Mark Mathews has confronted fear in a way that many of us never do. As a professional Big Wave Surfer he has won 3 Oakley awards and ridden some of the biggest waves that have ever been ridden by anyone on the planet. Whilst having confronted a lot of terrifying situations Mark is still not immune to the crippling effects of fear, but has tapped into simple strategies to make sure it doesn't stop him from doing what he loves. This episode is a unique insight into the professional world of big wave surfer, and the personal challenges it can force you to face along the way. Mark has had his far share of substantial wipeouts and injuries and in this episode we talk about his rehab from his latest injury and the drive to get back on the board. At the end of the interview Mark shares why just making sure that every day you are getting better than yesterday is the key to living a stand out life. Listening to these two is like chatting to your best friend. Their story of friendship was love at first cyber-stalk (or close to that); and how they have taken their individual skills and leaped into a new career together is a unique story. During this episode Lise Carlaw and Sarah Wills, better known as Those Two Girls, give us a glimpse into the uniqueness behind their drive and success (Sarah's regular 'welling-up' in our chat gives you an idea of how cool it is...or how much she doesn't mind a little cry). They’ve become popular for their distinctive style and walk the line between smart and irreverent, with warm communication styles and disarming onstage banter. Lise and Sarah's natural female friendship chemistry is engaging and, with a #1 national morning show across Southern Cross Austereo’s HIT network (Fox FM, 2Day FM, HIT 105, HIT 107 Adelaide, and 92.9 Perth), clearly audiences want to hear more from them. We talked a lot in this episode about finding 'that' friend in adulthood, dealing with imposter syndrome, the business of monetising a friendship, and why at the end of the day you've just gotta back yourself. You'll wanna grab a cuppa and settle for this episode, it's a cracker. Our identity is central to who we are as human beings - and it is so often tightly connected to our upbringing and our family. With a story so powerful it was featured on 60 Minutes segment - A Long Way Home. Joel was born in the Philippines but was separated from his family and found in a busy marketplace when he was five years of age. It was like every parent and every child's nightmare. Nearly 31 years on, having been adopted and raised by an Australian family, Joel embarked on what seemed like an impossible mission to track down his birth mother in the Phillipines. With virtually nothing to go on except knowing the date and location he was found, Joel undertook a journey that would change his life forever. This is a powerful conversation with Joel that reminds how important it is to reconnect with our identity. In 2015 she won the National Telstra Business Womens award, the AFR’s BOSS Magazine Young Executives of the Year - Winner, and the following year was named in the Westpac 100 Women of Influence list. Dr Catherine Ball is nearly as nerdy a nerd as you can find. Her mum imparted a strong sense of independence and David Attenborough gave her a passion for planet earth, and these two virtues continue to serve her in her work today. With a background as an Environmental Scientist Catherine talks about her latest passion project - She Flies aims to reach 100,000 Australian women and girls by 2020. Let’s just say this conversation has inspired me to go and buy a drone and learn to fly it. We talk about why we all need to embrace technology and try something new on a regular basis - which is a pretty good philosophy on life. Catherine is passionate, energetic and her drive for change is engaging. This is a conversation that will leave you wanting to unleash your inner nerd. Soak up all the energy that is Catherine Ball. When I started this podcast series I always knew I would have the conversation with Peter Baines. Peter has held many positions and seen sides of humanity many of us are not exposed to. As a forensic copper Peter Baines worked at the cold-face of communities. Throughout his career his work landed him in places like Bali after the Bali Bombings and Thailand after the tsunami. In this conversation Peter provides a personal insight into the drivers behind our decisions and why when you are rock bottom sometimes the only thing you have left is to help others. For last 10years that's what he has dedicated his life to. Over 10 years ago he launched Hands Across the Water, charity supporting children at risk in Thailand. The charity now has seven homes across Thailand. This is a conversation that will stay with you long after listening. Bella Zanesco is a modern day polymath. A world champion sailor, creator of best practice holistic leadership programs, passionate advocate for full-expression and award winning entrepreneur, her mission is to make a healthier, happier workplace. As a business executive, she delivered over $5b to Fortune 500 companies including Pepsi Co, Sainsbury's, Reed Elsevier, Unilever, and The Royal Mail. And in 2015, was awarded UK’s Top 50 Young Changemaker for her work coaching at-risk high performers. Despite all these successes Bella hit a hurdle experiencing a bout of depression. The way she navigated this launched her fascination in helping others become fully expressed. Her book ‘Smart Girls Screw Up Too’ has just been released and incorporates her research, her own experiences and provides a platform for working women to come back to themselves. What is your relationship like with your body? In this body conscious day and age that might be a hard question to hear, but a critical one to contemplate. Because for far too many of us the answer to that question is not great. Taryn Brumfitt is the person behind the global phenomenon the Body Image Movement and in 2014 released a documentary EMBRACE which was viewed over 25 million times on the internet. The inspiration for EMBRACE came about after Taryn posted an unconventional before-and-after image on the internet in 2013 that sparked an international media frenzy. The image, which embraces body diversity, was seen by over 100 million people worldwide and led to hundreds of interviews and articles. Taryn is on a mission to harness and facilitate positive body image activism by teaching women the value and power of loving their bodies. You gonna love yours after this listeing to this interview. A proud Vietnamese refugee, Diem Fuggersberger has an insatiable hunger for big ideas and chasing big goals. She is relentless in this pursuit. Amongst her incredible successes Diem has also experienced significant business and personal challenges and in our conversation shares openly how she faced these challenges and held strong to her values. She unpacks her incredible story fleeing Vietnam with her familyvia boat, navigating life in a new culture, and how her ability to sell herself and her ideas has launched her on her entrepreneurial journey. In the busy life Diem comes back to her family and her faith. Today, she is CEO of Berger Ingredients, and the founder of Coco & Lucas and continues to have grand plans for the future. Perry is engaging, connected and funny and holds the claim to fame that he showed ‘Superman’ how to fly - you’ll have to listen into this episode to find out how. With the mindset that everything’s possible - enjoy this conversation with Perry Cross. Multiple best-selling author, international speaker and acclaimed nutritional biochemist; with all she continues to achieve Dr Libby Weaver is about as down to earth, real, and warm as they come. Libby has dedicated her life to exploring the science behind well-being and how what we eat, what we think and our core beliefs impact how well we really feel. In this episode we explore why changing eating habits has nothing to do with food, the importance of understanding hormone health for overall health, as well as practical tips on dealing with busy and overwhelm. Libby shares her own tools as well as her belief that everyone has beautiful hearts. Matina Jewell grew up in the hinterland of Byron Bay before launching into a military career that saw her embark on military and peace-keeping operations around the world. Matti had a remarkable career in the military earning eight war medals across 15 years. Throughout this conversation we talk about mindsets of leadership, dealing with hardship and her experience of a career-ending injury whilst on a peace-keeping mission in the Middle East. Matti has literally been at the forefront of hardship and warfare and continues to use the strength she found in these experiences in her work today. She has learnt the power of being able to let go of control and accept the opportunities that come your way. Skye Anderton is owner, founder and Chief Dreamer at Ruby Olive. Her colourful imagination, thirst for travel, and passion for designing beautiful things gave wings to her dream, and in 2010 Ruby Olive the label was born! Skye’s been around the block a few times. She has over 14 years experience in the Fashion Accessory industry with eight of those years spent working in London as a designer, product developer and accessories buyer. As a result, Skye loves big red buses, has a soft spot for corgis and enjoys the odd glass of Pimms. In this episode we talk about creativity and adventure, and the critical need to make space for both in our busy lives. After a very successful 10 year career as an elite athlete. After breaking onto the world stage as a 17 year old with an amazing performance of two Gold Medals at the Melbourne 2006 Commonwealth Games, Stephanie went onto achieve greater success becoming one of our greatest ever Olympians when she won three Gold Medals at the 2008 Beijing Olympics, all in World Record time. Following retirement from the sport she loved so much, Stephanie went on to win the high rating Australian TV show ‘Celebrity Apprentice’, making her the youngest to win the show worldwide at 24. Now as an entrepreneur, founding her kids swimwear company, RACERiCE, Stephanie believes it’s her time to give back. An adventurer at heart, traveling the world as a young Aussie backpacker in the 80’s, working as a camp councillor in San Fransisco to being a Stewardess on David Bowie’s yacht. She then went on the adventure of entrepreneurism and 17 years ago launched one of the first juice bars in Australia - before there was one on every corner. The name of this juice store was Boost Juice - which now has over 420 store in 13 countries. Interestingly enough Boost has more outlets in more countries than any other juice bar in the world. Janine Allis is a dynamic personalityShe is one of the investors on the Channel 10 show, Shark Tank, which launches into season 3 this week in Australia. Janine is natural, warm, generous and experiences the same difficulties in juggling it all that many of us do. Soak up the insights and stories from the beautiful Janine Allis. Julie Cross is a dynamo human, a multi-award winning speaker, and in her own words, a non-award winning mother of two boys. Two years ago Julie put a post up on Facebook one Sunday evening of her in her bikini talking about body image. She woke up the next morning to 120K comments and 80K shares, and a whirl-wind of media attention - she’d gone viral. In this conversation she unpacks what this was like for her and why she continues to share her message to various audiences. Julie shares empowering messages about the difference we can make with the people around us when we reach out - the story at the end of this conversation is one that will give you goosebumps. In 2016 Tricia was recognised as CEO of the Year in Australian HR Awards for her work at Churchill Education. Tricia has a fascinating story - in fact stories was the common denominator in our conversation. Tricia is one of the most captivating story-tellers that I have encountered. Having worked as a Crown Prosecutor for 10 years, launched her business with her husband Randall after he was diagnosed with PTSD, and navigating the world with four beautiful children, Tricia shares the belief that all of us need to share our stories. Her approach to building workplace cultures is simple and hard at the same time. Calling forth the brave hearts and minds of others. Kathy Lette is a celebrated and outspoken comic writer who takes on serious current issues, and was recently awarded an honorary doctorate from Uni of Wollongong. She is one of the pioneering voices of contemporary feminism and you’ll hear throughout this conversation that she is still rallying the troops in this regard. In fact her call is for women to be given the reigns of the world for a stint and let’s just see how it works out. Having written 14 best sellers, published in 17 languages - from puberty blues to her latest book Best Laid Plans - Kathy unpacks the power of words and why they have become the tool of her trade. This is a power-house episode with a power-house woman, Dr Kathy Lette. A mother, singer, producer, songwriter, pianist and business woman, this 4 x ARIA Award winning and 7 x platinum selling songstress first received widespread praise as the angel-voiced songstress of indie-pop band George and has since taken audiences on sublime excursions through Jazz, Pop and Classical music. Katie is currently the Artist Director of Qld Music Festival which is the largest music festival in the world. When I decided to launch this podcast I wrote out a wish list of all the people I’d love to interview and Katie’s name was at the top of this list. Our chat was connected, personal and pure delight. In this interview we unpack the importance of giving ourselves permission to unplug and connect with nature, the magical connection of the power of music, and the glorious freedom of boredom. Ambitious, feisty, driven, and passionate Michelle is a dynamic force. Having spent 17 years in the travel industry after owning and managing a hotel in Alice Springs from the age of 23, Michelle found herself on an adult gap-year exploring what impact she wanted to have on the world. Four years ago Michelle set up the Sydney office of an agency business and is now the Global COO of Bastion Collective (a global marketing communications agency). Despite her career achievements happiness has always been her metric stick, and when she realised she didn't feel settled early in 2016 she embarked on some internal discovery to redesigned what her role meant to her. Starting a side creative hustle, Knox | Cox Candle Co, Michelle navigates a global business during the week and spends her weekend wicking candles with a glass of bubbles or setting up stalls at local markets. Emma Booth is an Australian Equestrian Paralympian. She previously competed in Eventing (which comprises of Dressage, Cross-Country and Show Jumping) until one evening in 2013 – while travelling home from a competition – was left paralysed after a being involved in a horrific car accident. Only six months after sustaining the life changing injury, Emma was back in the saddle and learning to ride a horse without the use of her legs; and made her Paralympic debut in Rio de Janeiro in Sept 2016 - only three years after her accident. Inspirational is a word that is often thrown around, but in this conversation Emma's tenacity, belief in the human spirit around her, and her laser-like focus in doing what matters most to you will indeed leave you inspired (if it doesn't you might want to check your pulse). Soul-filled, purpose-driven, uber-organised, dynamic leader, and a voice for those who don't have a voice, are a few of the ways that you can describe Olivia Ruello. Stepping into the role as CEO of Business Chicks, Australia's largest women's networking organisation, Liv injects her belief about culture, supporting women, and creating incredible communities that are build on the desire to lift each other up. With a background in industrial relationships and a stint in the corporate setting it's evident from this conversation that Liv has always, and will continue to be, a voice for those who don't always have a voice. As an advocate of gender equality, Liv's quote that 'until we have as many mediocre female leaders as we have male leaders we need to have quota's', is one I've used repeatedly. Throughout our conversation we explore how to create a thriving culture that is enviable by others, the importance of supporting women in leadership roles, and the the power of hearing someone say 'I believe in you'. Jacinta is one of my all time favourite human-beings. Along with her brother Justin, Jacinta launched the highly successful US franchise Anytime Fitness into Australia in 2008. With over 2700 clubs and 2 million members worldwide, it has become the quickest growing segment of the world s fastest growing fitness chain, and is Australia’s number one health club chain. As well as being a mother of three young children, Jacinta’s entrepreneurial spirit has led to the development of several other business and personal ventures over the past 12 months, making her a true inspiration to Australian business women. Launching Urban Yoga - a world first yoga concept, and establishing her purpose-filled foundation Human Kind Project, creating a community of people, businesses and other entrepreneurs to create change in the world. Elka Whalan (nee Graham) reached world #1 in 200m freestyle, attended two Olympic games, as well as Commonwealth Games and World Championships in her 7 year career. She was part of that famous medley relay team who were disqualified in 2001 for jumping in the pool too early, and as Elka says were world champions for all of 30 secs. Married to waterpolo Olympic champion Thomas Whalan together they have 4 kids under 6. Elka talks about her career in the media, the shift in identity throughout her life, her non-negotiables, and how faith is a guiding principle in everything that she does. In 2016 Elka has started Queenhood for the woman who knows her worth, empowering, uplifting and encouraging all women to unite and support one another. Plenty of people talk about being a serial entrepreneur, not many can back it up with evidence. Dan can. Although success wasn't always forth-coming. In 2013 Dan was 2 weeks away from unemployment after 8 years of business failure. Within a week he launched a WordPress support service called WP Curve. Since we recorded this episode Dan has sold this business to GoDaddy. He is also a partner in a craft brewery, and still finds time to hit the waves on a regular basis. In essence he doesn't stop. But he's learnt a few strategies to being the boss of busy along the way, a few of which we unpack in our chat together. Author of four best-selling books including his latest, Create or Hate Dan can often be heard talking about how important creative endeavours are. It's key for all of us to be pushing back on busy and finding time to create. Shelly Horton has never been afraid of forging her own path. As one of Australia's leading media personalities Shelly's opinion can be heard nationally a number of times a week in her regular segments on Channel Nine, while she's chatting with Richard Glover on ABC Radio, and as part of her popular and controversial health web series - Things You Can't Talk About On TV. There are bucket-loads of laughter in this episode as Shelly unpacks her stories from an extensive and varied journalism career. Including her first 'on-air' gig which was a complete 'fake-it-til-you-make-it' moment, to launching her video production company ShellShocked Media with her husband. Shelly also reveals her one big regret in life - we're not meant to have one but this one still haunts her. There are infinite moments of 'aha' and permission to be real in this conversation, including the reminder to us all to turn up 'camera-ready' before your ready for your new role - whatever that role might be. Soak up the laughs and wisdom dished out by this amazing woman. Keri Krieger is one of those people that everyone needs to know. Seriously. Take a moment now, Google her, then come back. Keri helps women come home to themselves. In their practices. In their personal lives. In their bodies. Having spent over a decade working in health retreats around the world with a background in acupuncture and a deep knowledge of Chinese medicine. She has developed a unique treatment style called Rockupuncture; which is a delicious combination of acupuncture and hot rock massage. Whilst being brilliant as a ‘hands-on’ therapist, Keri also offers support, advice and guidance as a health coach with Executives and individuals coping with the overwhelm of ‘busyness’. Magdalena Roze is an award-winning TV presenter who got so fascinated with the weather she went onto to study it and became a meteorologist. A few years ago she underwent a sea change moving from Sydney to Byron Bay where her husband Darren Roberston, chef from Three Blue Ducks fame, established the restaurant at The Farm on the outskirts of Byron. In this episode Mags shares the challenges and opportunities that arise from this sea change and the importance of connecting with your sisterhood as she steps into her new role as mother to her beautiful boy Archie. Mags combines her passion of weather, food, and her family in all that she does. Mags has some exciting new ventures happening this year including the launch of her book 'Happy & Whole' in late March. Kylie Rogers is someone who knows a thing or two about marketing - after 17 years working in Sales and Marketing with Channel Ten it was actually a comment from her 6 year old son that jolted her into realising she had to make a change to her career. After a break with her family she eventually landed the role of National Sales Director with the largest independent women’s website Mamamia and is now the Managing Director for this business that is set to go global in a big way. Kylie is such a delight and shared openly the struggles and successes of stepping into a leadership role, her tools (non-negotiables) in her week, and why we all just need to breathe (ahhhhhh....). Working as a voice coach for the past 20 years, Lucy has dedicated her life to supporting people (including influential women) to express themselves so they can inspire and influence (which all of us do regardless of your job). Lucy is the founder of a Sydney based business, Voice Coach, and consults with Executives, influential people, and organisations globally. Taking what’s she’s learnt through deep training in performance Lucy makes the art of influence infinitely relevant to the business world. Lucy is both fascinating and captivating, and completely passionate about all of us getting clear on our right to express our voices. She also shares that it's her belief that ‘silence is violence’ - when we don’t express what matters it impacts our lives destructively. Launching Women’s Health magazine as the founding editor in 2007, Felicity Harley is one of the most recognised, awarded, and loved editors in Australia. Felicity is an incredibly talented editor, who was named in Westpac’s 100 Women of Influence in 2012 for her initiative around the ‘Support Women in Sport’ campaign which aimed to bring media coverage to female athletes. Wife to Tom Harley (ex-Geelong captain) and Mum to two boys, Felicity unpacks her own strategies for dealing with pressure and relentless change (the good news is it involves chocolate). She shares her excitement and anticipation as she is about to embark on new venture and also gives us a couple of tips on how to stick to our goals in the new year (cause you know we’re not that great at that). In a real and honest way Felicity leaves us realising that the constant pursuit of balance is something we've gotta let go of. Stylist to the stars, Jules Sebastian has paved her way as a television presenter on MTV and recently as the stylist for Mel B on the X-Factor. Jules grew up in Adelaide and met her husband, Guy Sebastian (first Australian Idol winner, and award winning singer/song-writer), while they were knee-high to a grasshopper. Jules talks about the shared Australia Idol experience, Guy’s win from her perspective and the way that life changed significantly for both of them. The couple then moved to Sydney where they now reside with their sons Hudson and Archer. One of Australia’s most popular female athlete’s, Laura Geitz has a stellar career. Captain of both QLD Firebirds and Australian netball team, the Diamonds, Laura has won both silver and gold medals at the Commonwealth Games; she lead the Diamonds to victory over the NZ Silver ferns after a 12 year drought; and won back to back championships as captain of the Firebirds. In this conversation Laura talks about how she manages the pressures of the big moments, and the advice and legacy that lives on from her greatest role-model, her Dad. As Laura steps into her new role of motherhood she talks about how she'll be hoping to navigate the focus on family with maintaining her own identity. Award-winning Journalist with a 23 year career with Canberra Times, convenor of Women in Media in Canberra, 2016 ACT Telstra Business Women's Award winner (Purpose and Enterprise), and founder of charity, 'Send Hope Not Flowers', Emma MacDonald has known both achievements and the tiredness of battling a high-powered career. Emma talks about the apprehension and excitement as she transitions into her new role as Associate Editor at Her Canberra. In this podcast Emma talks about the strategies she employs to hit reset, and the importance of having your sister wives. This conversation happens at a time as Emma is transitioning from a 23 year career to take the courageous step into a new role. As such she dives into this decision and the reality of stepping into the new. Emma is a generous and beautiful soul and these stories come through in this conversation. Owner and Founder of international success story Carman’s Kitchen, Carolyn Creswell is undoubtedly one of Australia’s highest profile business women. In 2012 she was awarded Telstra Australian Business Woman of the Year (after entering 16 times as she mentions in this podcast) and the winner of 2007 Ernst & Young’s Young Entrepreneur of the Year Award. As a proud mother of four young children with her husband Peter, Carolyn has a strong commitment to healthy work-life balance which is also reflected in the supportive culture of the Carman’s office. In this episode Carolyn delves into a mountain of truths that she has learnt in her 24 years in business that now underpin her business success and her constant pursuit for personal growth. Through learning from her own mistakes, Carolyn talks about the importance of prioritising sleep, on getting clear on what is important to you, and how to make sure you are as diligent with your time as you are with your money. This episode is loaded with thoughtful and ‘I’ve been there’ type insights for anyone juggling work, family, life, and even just how to have the best dinner party ever (because you don’t have to cook it). Three-time Olympic swimmer, Libby Trickett (nee Lenton), is well known for her beaming smile as she is for her determination and competitive nature. Whilst she learned to love racing in the water at the age of 4, the success she has had in the pool hasn't come without sacrifices. In this intimate interview Libby shares how it wasn't until watching the 2016 Rio Olympic games that she fully appreciated what she achieved in her swimming career. In her new role as QLD mental health ambassador, Libby shares her own struggles with mental health, and as Mum, the key actions she makes sure she comes make to in order to manage her own mental health. Global CEO of Business Chicks, Australia's largest women's networking group, Emma Isaacs is a trail-blazer. Emma With four kids under seven years old, and recently launching Business Chicks in the US. Emma has spent time with some of the world's greatest business visionaries, entrepreneurial minds and thought leaders including Sir Richard Branson, Seth Godin, Arianna Huffington, Brene Brown, Sir Bob Geldof and Ita Buttrose. In this episode Emma unpacks Business Chicks secrets and her unique relationship with fear. Maz Compton is a media personality that has been both in front of the camera, behind the camera, and hit the heights of radio hosting both a national drive radio show, 'The Dan & Maz show', and a Sydney brekky show. In this episode Maz talks about listening to her 'spiritual GPS', particularly after her national show was axed. She talks about the struggle that she found giving up drinking for a year - surprisingly it wasn't hard for her, but setting boundaries for yourself clearly annoys the crap out of others! Maz embraces the Stand Out life, even as the next adventures start to come her way.